Terriers are in Michigan for the first time since 2007, taking on the #4 Wolverines tonight and Michigan State on Saturday evening. Both games are part of the concluding weekend of the Big Ten/Hockey East Challenge, which Hockey East leads 9-4. Michigan has a 3-0-1 record that includes an opening night win against BC and a one-goal win and a tie against New Hampshire, both in overtime. Sophomore Andrew Copp and junior Phil DiGiuseppe have 6 and 5 points respectively. For the third game in a row, BU will face an opponent’s back-up goalie as sophomore Steve Racine is injured. However freshman Zach Nagelvoort stopped 39 of 41 shots in the win over UNH. Tommy Kelley, injured in the win against Wisconsin, made the trip to Ann Arbor and is expected to return to the Terrier’s top line with Danny O’Regan and Evan Rodrigues (photo). The Daily Free Press reports it’s likely that last week’s second trio of Matt Lane, Cason Hohmann and Robbie Baillargeon will remain intact. 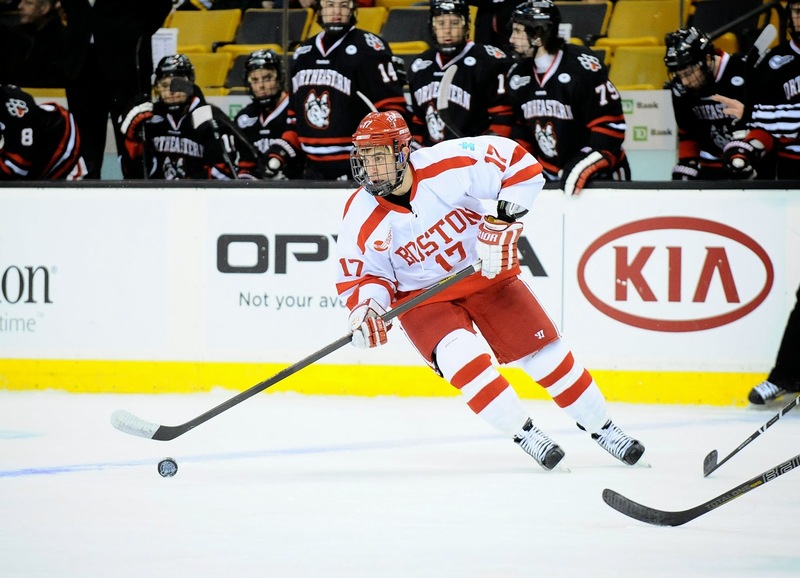 BU last played the Wolverines four years ago yesterday, coming away with a 3-2 OT win at Agganis Arena on a Joe Pereira goal (video). Terrier head coach David Quinn spent two seasons in Ann Arbor as head coach of the NTDP U17 squad from 2002 to 2004. Former Terriers John McCarthy and Matt Nieto were on the familiar ice at TD Garden in the Shark’s 2-1 loss to Boston on a goal in the final second of regulation. SharksTV caught up with McCarthy and Nieto when San Jose practiced at BU’s Agganis Arena earlier in the week. Alex Chiasson scored the Stars first two goals--his fourth and fifth of the season-- and added an assist as Dallas defeated Calgary, 5-1. His three points earned first-star honors and brought the former BU MVP's career totals to 16 points (11-5) in 16 games. Recap and video. Eric Gryba scored his first goal of the season in Ottawa’s 6-1 drubbing of Detroit. Wade Megan assisted on the overtime game-winner for ECHL CIncinnati in its 3-2 win against Toledo. Max Nicastro recorded an assist for Toledo. The Daily Free Press preview’s Saturday’s home opener vs. Yale.